Here's the last of my three Harrogate Online Registered Bloggers interviews, this time with Mercedes Viola, who I have known for many years online and have been able to meet up with in person several times since moving to Montevideo. I've always been impressed with just how dynamic she is, and how active and enthusiastic she is both online and in person. I’m Mercedes Viola, an English teacher from Uruguay, South America. I’ve been running a language school for more than 20 years designing and implementing general English and business English learning experiences. 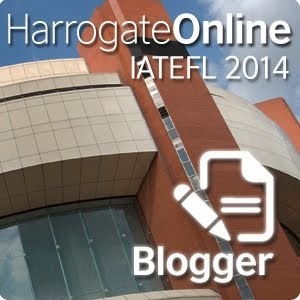 I’m a member of the IATEFL Electronic Committee and BESIG Joint Web coordinator. What areas of the conference are you interested in? Difficult question! I’m a curious person and love learning new things, so it’s difficult to choose what sessions to attend. I’m interested in learning technologies, debates about new pedagogies, new methodologies, new ideas, business English. Meeting people! I work a lot online and I don’t know most of the people I work with - the IATEFL team, the BESIG team. So, I’m really looking forward to meeting them in person, chat, and go for a drink. I do blog. I love technology and think it offers us the opportunity of sharing, sharing knowledge, images, ideas, music, anything. Blogging is one way of sharing. Could you tell us about your blog(s)? The other one is about language teaching and learning. I mostly post about things that are happening in the ELT world. I don’t write that much, I use videos, images and words. Continuing the interview posts about other IATEFL Harrogate Online registered bloggers, it's my pleasure to introduce Chris Lima to those of you who don't already know her. I first met Chris at the BRAZ-TESOL conference in Fortaleza in 2008 and have bumped into her at conferences ever since. My name is Chris Lima, I am a teacher, teacher trainer and researcher. In my talk I will discuss how integrating the reading of literary and creative material into teacher education and development programmes can give ELT professionals the opportunity to better understand the role of literature in language learning, participate in discussions of relevant issues, engage with different points of view, and develop their own language skills. Literature and language teaching, creativity in ELT, English for Academic Purposes. Yes, I have been blogging for 8 years – I wrote my first post in January 2006. My main blog is simply called Chris Lima’sBlog (not very creative at all). I started it blog in 2006 as a simple experiment with web technology and as a way to reflect on my professional experiences. It has grown to encompass all aspects of my teaching, my involvement with teachers' and other educational associations as well as my research interests. I also have anotherblog that I devote to my literary interests. Meeting my friends, advancing a couple of projects with some colleagues, and meeting new people. One of the other registered bloggers, Adam Simpson (blogging at http://www.teachthemenglish.com/) has come up with the idea of a blog chain reaction in the lead up to the 2014 IATEFL conference. The idea is for each registered Harrogate Online blogger "to choose two or three of this year’s registered bloggers and introduce them on their blog. These bloggers then in turn choose other registered bloggers and interview them…and so it goes on until we all have a good idea of who will be blogging about this year’s event." Please introduce yourself My name’s David Read, I’m from the UK and work as Technology Director at the English Language Teaching Centre, part of the University of Sheffield. I’ve been an EFL teacher for about 20 years and worked in 14 countries (don’t worry, I won’t list them!). As my job title suggests, my main interest is technology, particularly mobile and web apps for developing digital literacy. My two main interests are technology and English for Academic Purposes, so anything related to those. Any mobile stuff particularly, there seems to be a constant stream of new apps coming out and hearing what other teachers are using is alway useful. If you mean my audience for my session - very little! If you mean my blog, hopefully some useful reflections on the sessions. Just meeting up with other teachers, especially those I’ve worked with in the past. 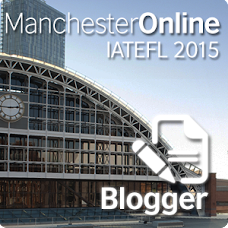 IATEFL is a great whirl through your recent and distant past! Sad to say, that due to work, this is the first year I won't be attending the IATEFL annual conference in 7 years, since the one held in Aberdeen in 2007. Fortunately, much of the conference is streamed online, thanks to the British Council, and IATEFL Harrogate Online is now live. I've signed up to be a 'Harrogate Online Registered Blogger' and expect this will encourage me to participate virtually and report about the conference even though I'm miles away in Montevideo. I signed up last year and it encouraged me to live blog a number of the sessions form the conference, so I'm hoping this year it will have the same effect. More than anything, I find it's one of the best ways to keep track of what people are talking about on the blogosphere during the conference and there are already 19 blogs listed on the site. Want to know more about what’s going on at the conference? Want to share your experiences as f2f or online participant? On Friday 4th April, 2014 at 17:00 GMT delegates from Harrogate and online participants from all over the world are meeting to discuss and exchange views of different talks, worshops, plenaries and interviews. Some guests will also be joining us to interact with the online audience. from Harrogate and online participants from all over the world are meeting in a special webcast live from the venue to discuss and exchange ideas.